This stylish country home on 2.86 acres incorporates the natural beauty of the surrounding forest w/ beautiful wood features inside and out. 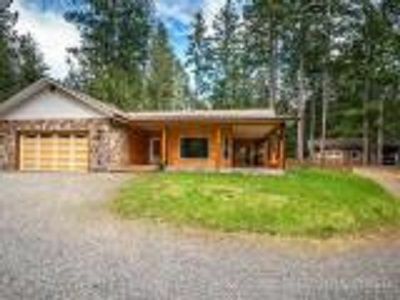 Set back along an avenue of majestic evergreens, the 1977 square foot rancher sits in a park-like setting and has beautiful stone and wood siding. A lovely wrap-around porch is supported by solid fir posts, and the rear patio features rich cedar accents, all inviting comfortable, year 'round outdoor living. Choose a formal entry into the spacious, tiled foyer, or enter directly into the impressive great room with its vaulted ceilings, wide-plank flooring, and cozy wood stove. The spacious country kitchen has alder cabinets, a large central island with second sink, and opens to a large dining area. 9' ceilings and wide passages throughout the home. Master has huge en suite & 3rd. bedroom w/large windows makes a great office. Huge, deluxe 22x30' workshop w/ heated floor and bathroom. Enjoy peace, tranquility and solitude in the country!